Archeologists have unearthed the bones of a gigantic 350,000-year-old animal during excavations at Karain Cave in Turkey's southern Antalya province, reports said Monday. 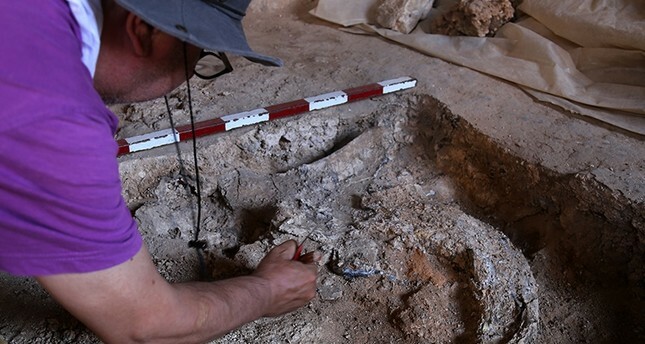 The discovery marks the first time researchers find remnants of humans who lived during the Paleolithic and Neolithic periods, according to Harun Taşkıran, who leads the excavations at the site and is a professor at Ankara University's Archaeology Department. "We discovered the rib bones, teeth and skeleton bones of big mammals," Taşkıran said, adding that they also discovered a giant animal's hip bone, jaw and teeth. The professor noted that the 50 centimeter hip bone dates back 350,000 years. "As in the other cave excavations, the excavated soil is brought to the excavation house with buckets to be washed and then it passes through three different sieving methods," Taşkıran said. "Every finding, even the tiniest [remnants], provides us with access to new information about the past." Taşkıran underlined the significance of Karain Cave excavations in uncovering the history of Antalya and Anatolia. "Thanks to the excavations at Karain Cave, we have dated the history of Antalya to 500,000 years before. There are 500,000-year-old remnants here. Neanderthal bones of early humans have been unearthed in that cave. For this reason, this cave is really important for Turkey." Located some 27 kilometers northwest of Turkey's Antalya province, the Karain Cave sits 450 meters above the sea level. It contains three main chambers, passageways and halls. First excavations at the cave were launched in 1946 and a wide range of artifacts discovered at the site can be seen at the Museum of Anatolian Civilizations.